There is an invite for the launch of the Redmi Note 7 in India which has been leaked. According to the invite, Xiaomi will be launching the Redmi Note 7 in India on February 12. There was also a tagline on the invite which says “Apna Time Ayega” which is a phrase used in a song from an upcoming Bollywood movie of Ranveer Singh "Gully Boy". The phrase here is used to attract the low budget audience as the price of the new Redmi Note 7 in India is said to be starting from Rs 9,999. Despite its price, the smartphone has got some really cutting-edge features like a dual 48-megapixel camera and more. Xiaomi India Managing Director Manu Kumar Jain posted an image of him along with Xiaomi CEO Lei Jun holding the Redmi Note 7 in his hand. It might be a clear way to show that the launch of the new Xiaomi smartphone is on the way. There is an invite for the launch of the Redmi Note 7 in India which has been out now. According to the invite, Xiaomi will be launching the Redmi Note 7 in India on Feb 12. 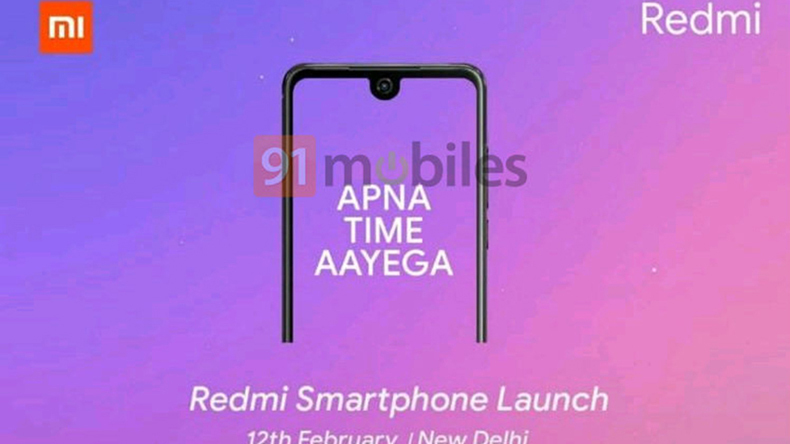 There was also a tagline at the invite which says “Apna time Ayega” and an outline of the new smartphone showing the water- drop notch design. Price of the new Redmi note 7 in India is said to be starting from Rs 9,999. The all-new Redmi note 7 features a 6.3 – inch full HD+(2340x1080px) LTPS display with 19:5:9 aspect ratio, 450 nits brightness, 84 percent NTSC colour gamut. It will be coming with a Gorilla Glass 5 and 2.5D curved glass protection. Smartphone runs on a Qualcomm Snapdragon 660 octa-core SoC paired with 3GB, 4GB and 6GB RAM options along with 32 GB and 64GB storage options. A Dual camera setup with a 48 megapixels Sony IMX 586 sensor with f/1.8 aperture and the 5-megapixel sensor has been introduced at the back whereas there is 13-megapixel selfie camera in the front. More features are 4,000mAh battery with quick charge 4 supports, USB type-C port, 3.5 mm audio jack, 4G Volte Bluetooth, Wi-Fi and MIUI 9 based on Android Oreo.